Poinsettias (Euphorbia pulcherrima) remain one of the most popular holiday flowers. Hybridizers have expanded the range of colors from the familiar red to pastel yellow and vibrant bi-colors. One of the most common questions after Christmas is “How can I care for my poinsettia so that it will bloom again next Christmas?”. While this can be done, it's a very fussy, exacting process and since the plants are not that expensive, you might just choose to start fresh next year. Light - Place it near a sunny window. South, east or west facing windows are preferable to a north facing window. 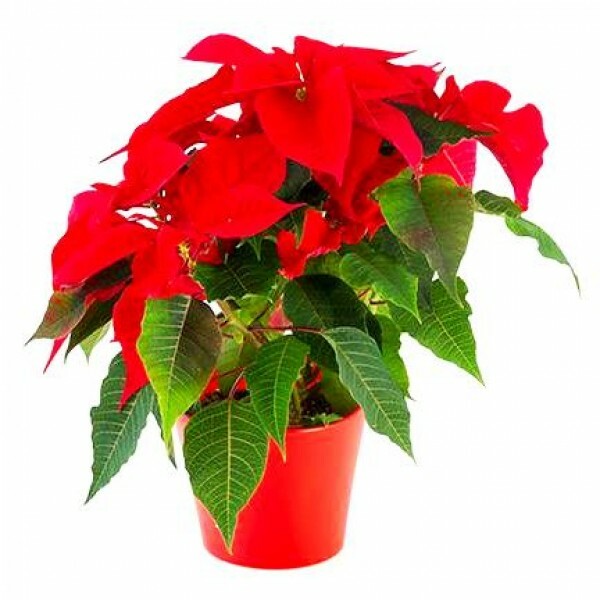 Poinsettias are tropicals and will appreciate as much direct sunlight as you can provide. Heat - To keep the poinsettia in bloom as long as possible, maintain a temperature of 65 - 75 degrees F. during the day. Dropping the temperature to about 60 degrees F. at night will not hurt the plant. However, cold drafts or allowing the leaves to touch a cold window ca injure the leaves and cause premature leaf drop. If you've ever see a gangly poinsettia in bloom, with only a couple of sad looking leaves hanging on, it was probably exposed to temperatures that were too cool or extreme shifts in temperature. Water - Water the plant whenever the surface feels dry to the touch. Water until it drains out the bottom, but don't let the plant sit in water. Wilting is another common cause of leaf drop. A wilted plant can be revived and salvaged, but it will take another season to improve its appearance. Humidity - Lack of humidity during dry seasons, in particular winter, is an ongoing houseplant problem. If your home tends to be dry and your poinsettia is in direct light, you will find yourself watering frequently, possibly every day. Place in a room where there is bright natural light but not where the sun will shine directly on the plant. Keep the plant away from locations where it will receive hot or cold draughts. Place the plant high enough to be out of reach of unmonitored children and pets. Set the plant in a water-proof container to protect your furniture. Water the plant thoroughly when the soil surface is dry to the touch. Discard any excess water which remains in the saucer after 10 minutes. The bright colour of the bracts will remain longer if temperatures do not exceed 22°C.